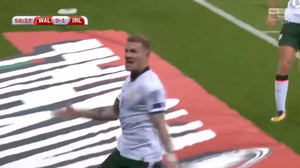 It was a slow burn and it kinda crept up on me but I love James McClean so much now. Yeah, he’s improved immensely imo, and at the risk of stirring up old controversy, takes some courage to decline the poppy on his jersey. #COYEBT Come on you English B team. The chant to be heard at the blushirt get-together this weekend… Along with #bring back the queen# and their favourite #stand up and fight – for tax evaders and vulture funds…. Eamons bitterness would make you puke..
At least the football team members have Irish passport, unlike half dozen of the Oirish foreigners on the D4 rugby team. Come on you boys in green, Come on you boy McLean !